that a simplified version of the discipline that keeps big companies on track can help small business owners better achieve their goals. Becoming familiar with project management tools and techniques can give you a competitive edge—providing quality services and products on time and within or even under budget. It can also make you significantly more productive as you adopt a project management mindset—documenting, monitoring, adhering to repeatable processes and being able to quickly adapt to change. 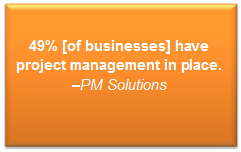 Adding basic project management to your skill set or that of staff members can take your business to the next level. 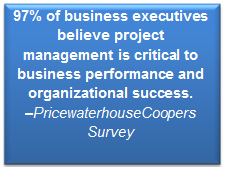 Big business adopted project management decades ago as they struggled to meet corporate goals and satisfy their stakeholders. As a small business owner with the ability to be more agile than your corporate counterpart, project management could be your silver bullet. At its very basic you’ll be able to bring products and services to market quicker, use your limited resources more efficiently and keep your customers satisfied and coming back for more. The benefits of good project management—i.e., planning, scheduling, staying on budget, designing repeatable processes—are so well documented that nearly half of businesses practice it. However, to avoid bad execution of projects that lead to failure, you need a solid introduction to the basics. As accidental project managers, entrepreneurs do need a level of formal project management training if for no other reason than to become familiar with the language in order to work with project managers they may eventually have to hire or work with on contracts. As their firms grow, business owners should consider having staff members learn the basics of the discipline to successfully complete their projects. A worthwhile investment. Thursday, October 27th 6:00 – 8:30 p.m.